Register Log In ECN Forum Forums NEC & other Code issues Mixing of equipment on a panelboard? I would be most concerned with the three poles tied together on the bottom left on what appears to be a single phase panel. One of those breakers is a GFCI. As for mixing of equipment, it is getting harder to avoid now that single entities own all these sub brands such as Schneider, Eaton etc. I was not aware anyone had a listed 3 or 4 pole handle-tie yet! I have a local plan checker here that insists the intent of 210.4(B) is that a fault in one circuit will trip all circuits within the multiwire circuit. Reasoning does no good with him. Is this sort of handle-tie acceptable anywhere? I'm not overly concerned ... regardless of the 'fine print' regarding 'listing,' 'classified,' etc. Good heavens, some clowns are carrying it to the extreme of saying you can't put a classified breaker in an obsolete panel, because, they argue, there is no way the breaker maker could have provided UL with a smaple of that exact panel for evaluation. Ditto for the various mergers, etc. Again, some folks will say you can't put a Brand X breaker in a panel made by Brad Y, even though the two were once the same firm. You need a scorecard to keep them straight. Personally, I consider the desires of certain manufacturers to prevent standardising parts to be simply ignorant. "Legal logic" aside, look at every successful product, and you see that it has both opened itself to others, as well as defeated technically better, but proprietary, competitors. VHS/Betamax, Windows/Apple, and Zerk/Alemite are all such examples. I'd rather see a genuine C-H breaker in a Square-D panel than a counterfeit. Finally, there are plenty of perfectly legal panels out there that were not made by the guy who made the breakers. A certain -was it Thomas & Betts?' panel comes to mind, as well as the fine panels made by American Switchboard. 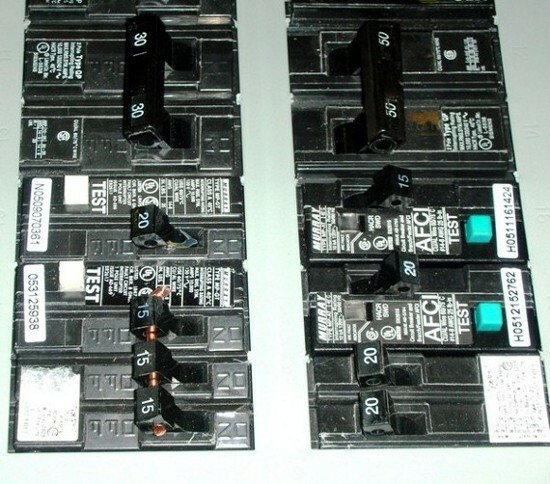 What we really need is a way to test breakers for proper operation. Only then could we tell if things are operating properly. If they can invent 'arc detetors,' then a simple overcurrent test ought not be that difficult! Why would you want to trip that "Twin" 15 amp? Do they think it will give them 240 volts? Plus why would they want to trip a GFI breaker with another breaker. Also it goes without saying that the "tie handle" is not an approved listed method. I also agree with the rest, it is getting tough to figure out if the CH breaker is a "BR" breaker and if it can go into a CH panel, a GE panel, Murray panel, ITE panel, etc. ITE was making breakers to go into Sqaure D panels. What is this world coming to? Bottom line, one added circuit in an existing panel, brand 'x' breaker, might get by. However, do a service upgrade, or a new install....all must be of same mfg. As you and I know, we know how to get past the manufactures rejection tabs. Which also helps me in my inspections. How many CH twin breakers do you see in a CH panel that doesn't allow it? I also count breakers when I see an ITE panel that says 20/20 MB and as I look in the panel and see 24 breakers. Have you guys seen the new 60 circuit panel yet? I have heard about it and seen pictures in the trade mag, but I haven't seen it yet. I believe our friends from the great white north already have 60 circuit panels. I would think it would be trivial to list them here.